In order to be able to run some fun contests & events before the release of the dogfighting module and beyond we are holding select auctions of limited edition surplus pledges. The base cost of each of the auctioned pledges will go to their respective previous owner with all additional funds going into the prize acquisition pool of The Enablers organization. The race is on, will you get to them in time? Only the person with the highest bid will be the first to reach this limited edition item! You have 48 hours from the above post date to place your bids below. All bidders must be The Enablers members (either in The Enablers organization or have a pending org invite in their RSI account). Once the designated auction time has elapsed, the earliest highest bid will be declared the winner. The winning bidder will be contacted via the RSI PM system. That person will then send 'Capt_Glume' (The Enablers treasurer) the winning bid amount (rounded up to the nearest five dollars) in RSI pledges/gift certificates. Once payment is received the auction item will be gifted to the winner. In the unlikely event that the winning bidder reneges on the auction will be offered to the next runner-up and so on and so forth. 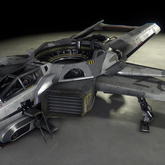 Only RSI USD credits will be accepted as payment as we wish CIG to benefit as much as our organization. Do you have a limited edition pledge package that you do not want? Please contact Capt_Glume to arrange to have it auctioned in a similar manner in a future funding Drive (you would be paid, in RSI credits, for the base value of the pledge). Please do not post discussions and/or questions in this thread. Please only post your bid (in $5 increments) as a reply to this thread. The Opening bid is $20! Happy Bidding & Good Luck! Congratulations to Spaceman Spiff for winning the Limited edition F7A Military Hornet Upgrade for $30! That is $10 raised for our Org!